You are currently browsing the category archive for the ‘Navy life/Navy wife’ category. My husband is sometimes under the impression that I am the alter ego of a super hero called Swiss Miss who has the power to repel evil with a blast from her alpenhorn and who finishes off the bad guys with large wooden buckets of milk. Her Appenzell genes make her vulnerable, however, to ingenious traps baited with cheese and particularly to fits of the mopes. She enjoyed this lovely piece by Joel Johnson from 43 Folders on forgiveness. Forgive yourself for losing focus. Then forgive yourself for worrying about losing your focus. Forgive yourself for making unrealistic goals. Forgive yourself for making goals that aren’t big enough to keep you interested. Forgive yourself for doing work that’s not your best. Forgive yourself for comparing your work to the work of others. Forgive yourself for thinking something other than your work might be fun. Forgive yourself for any single thing you find yourself feeling guilty about. It reminded her of Bill Murray in What about Bob? What to choose? Knob Creek? Asahi? Chunky Monkey? A brisk walk through the streets of Taura? Perhaps some Steve Earle and Lucinda Williams. Eriko shared a Thai eggplant curry with me at lunch and told me you and Tom waved from the deck. Why do you always discourage me from coming down to the pier? Is it because you want your memory of me associated with home, with shared meals and shared drinks, and not the mechanical bulk of the ship? I picked up Banana Yoshimoto’s “Moonlight Shadow” and I couldn’t stop before the scene on the bridge where the narrator sees a vision of her dead lover waving goodbye. Much like my mistake last year to watch Brokeback Mountain on the day the ship pulled out, I chose another brilliantly terrible story to make me feel your absence even more acutely. You’d think I’d learn and read something cheery—but what? No, I’d transform anything into soft disconsolate tears. Look, I’ll toss you some Kipling if you swear not to mention that sucker Lucasta. Heh! Walk her round. Heave, ah, heave her short again! 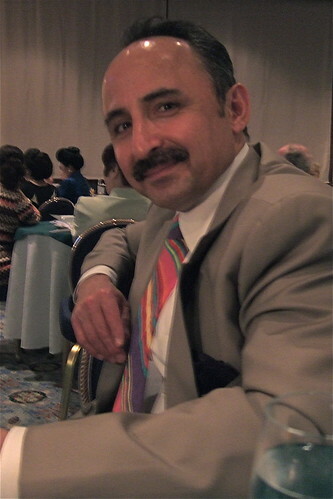 Carlos has a few days left in port, and then his ship leaves for good, never to return to Japan. The USS Kitty Hawk will be decommissioned after 47 years of service. I will remain in Japan for several more weeks. Even though Carlos has been home only two weeks, we’ve attended many bittersweet sayōnara dinners. We shared meals with friends. The Yokosuka Chamber of Commerce held a big bash to bid the USS Kitty Hawk farewell. The JMSDF gave a party on its rescue boat/pleasure barge. In Hayama, we ate an elegant kaiseki meal at Hikage Chaya, a 350-year-old restaurant, so Carlos could say goodbye to Japan itself. The past week has been devoted to memorializing our excellent life here. 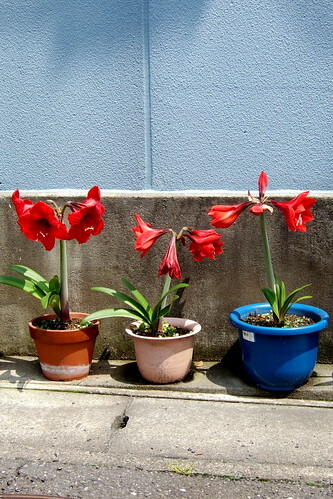 Photo: Flower pots in Taura. Today we had a different kind of Memorial Day. 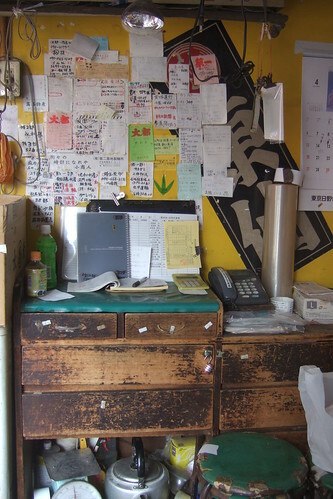 We headed into the early summer sunshine and walked through the old streets of Taura. 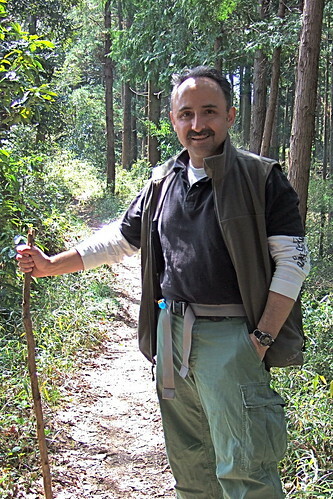 After Chozenji Temple, we turned left and walked up steep steps to the ridge road leading up the next valley. 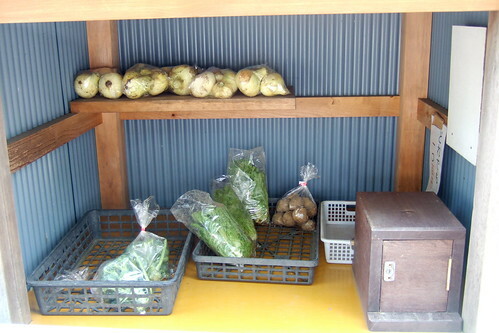 We climbed up and up, finding small farm plots with little stands offering potatoes, lettuce, onions, and sugar peas: 100 yen per bag on the honor system (change goes in the wooden box). 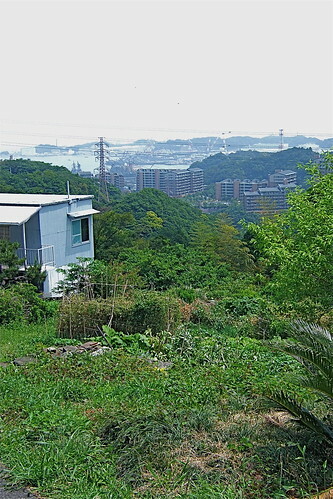 The top of the hill offered views of Yokosuka and the sea beyond. Soon we came to Tsukayama Park, which is the site of the tomb of William Adams (or Miura Anjin, in Japanese). You may have read James Clavell’s Shogun, or perhaps you are ancient enough to have watched the mini-series on TV in 1980. The story is based on the life of William Adams, an Englishman who was shipwrecked in Kyushu in 1600. After Adams was shipwrecked, the first shogun, Ieyasu Tokugawa, made him teach ship building and other military technologies. Adams built the shogun an English-style sailing ship in 1604, and then completed a 120-ton ocean-going ship. In return, Ieyasu gave Adams a fief in Hemi (now in Yokosuka City). Adams married a Japanese woman and had two children with her. He chose to stay in Japan, often acting as a diplomat between Japan and other nations attempting to trade with Japan in Nagasaki. He had some trade and exploration adventures in China and Okinawa before he died in Nagasaki in 1620. There are several monuments to the “blue-eyed samurai”: one where he was shipwrecked in Kyushu, one in Nagasaki, one where he lived in Tokyo, and one near Anjinzuka Station (on the Keikyu line). 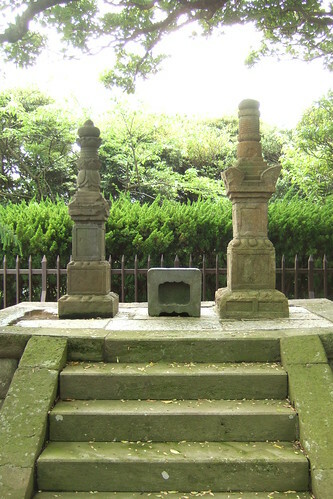 Photo: Anjinzuka, the memorial to William Adams and his wife in Tsukayama Park. 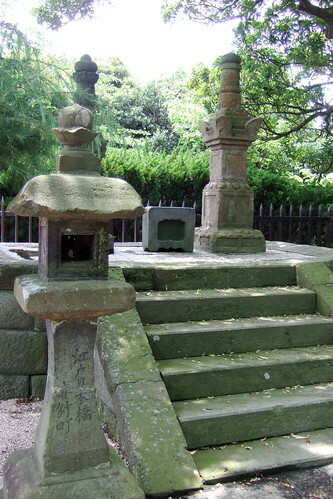 Anjinzuka means “burial mound of the pilot” (pilot as in nautical piloting). As I wrote before, Aoi me no samurai (Blue-eyed Samurai) is the local sake named after Adams. Look for it in the Yokosuka area. In April, there is an annual festival (usually coinciding with the cherry blossoms) in honor of Adams in Hemi and Tsukashima Park. The park has at least four different kinds of cherry trees. We walked down along forest paths, surrounded by birdsong and the flickering of white butterflies in the trees. Then we passed neighborhoods built on steep slopes and enjoyed the familiar views of Japanese gardens and lines of laundry. At the Anjinzuka station, we were lured into a restaurant by the aroma of curry and meat. 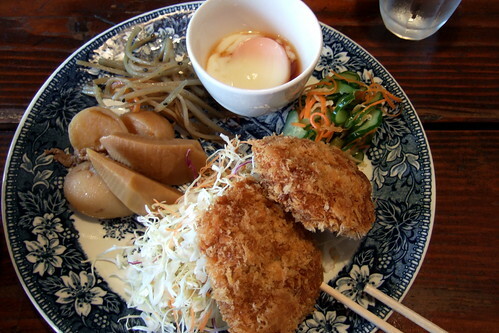 Photo: One of two daily specials at Buranko (“Swing”) Restaurant, next to Anjinzuka Station. We shared a daily lunch special: menchi (fried minced pork and onion patties breaded with panko flakes, shredded raw cabbage, braised bamboo shoots, potato, and a touch of beef, gobo (burdock root) and carrot kimpira with black sesame seeds, soft poached egg in dashi, and mixed salt pickle of carrot and cucumber. Not pictured: white miso soup with tofu (served in a mug) and a huge bowl of rice. The meal came with a drink and cost 850 yen (about $8.22). The other special was a curry rice set. Postscript: Well hello! It’s the first anniversary of You, madam, are no Sei Shonagon. Last Memorial Day I wrote my first post on this blog. Thanks for reading and commenting. It’s been fun. The Stash is usually his deployment outfit, grown to mark the days at sea, and also to assert his superior follicle qualities. It disappears soon after he returns home from unknown lands smelling of various petroleum-based fuels and the ocean. That first shower at home to wash off the Navy usually ends with the wielding of the razor. Recently, however, he only had a short stint home and so elected to take The Stash and me to Tokyo for a multi-course dinner. The Stash also likes to go hiking. When young, The Stash is violently territorial. When I get too close, it pokes and chafes. As it ages, it finds ways to live peacefully within our overlapping habitats. Knob Creek takes the edge off the Stash burn. Knob Creek takes the edge off everything.